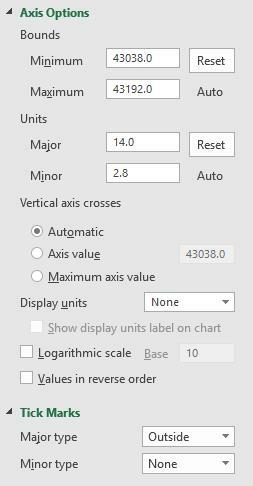 Gantt charts are not a built-in chart type in Microsoft Office (Excel, PowerPoint, and Word). There are templates you can download to create Gantt charts or add-ins you can buy. 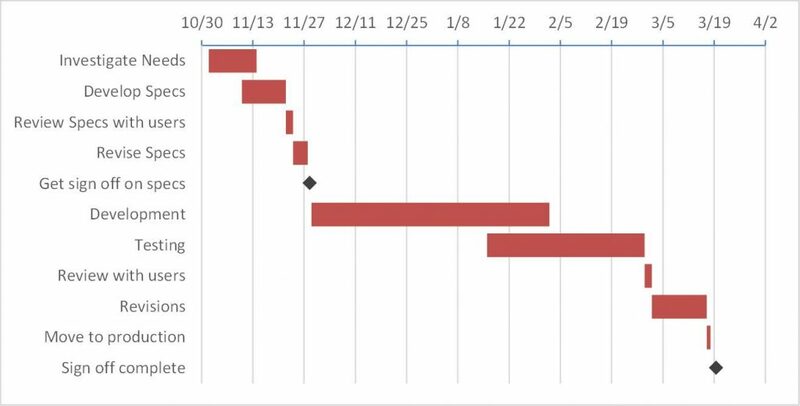 In this article I want to show you how you can create an accurate, informative Gantt chart with Milestones using a stacked bar chart in Excel (a similar method can be used to create the Gantt in PowerPoint). Here’s what our completed graph will look like. We start with a simple list of tasks with the start and end dates, as well as an indicator as to which tasks are milestones. I prefer start and end dates to start dates and durations because in most cases durations do not account for weekends and holidays, making the calculations much harder. Here is the list we start with (this list can be copied into Excel from project management software like MS Project). In the Start Date column, we enter a formula to copy the start date from the original table. 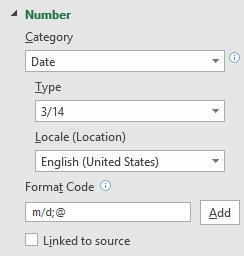 Set these cells to have the General number format so it changes the dates to the sequential date number Excel uses to store each unique date. 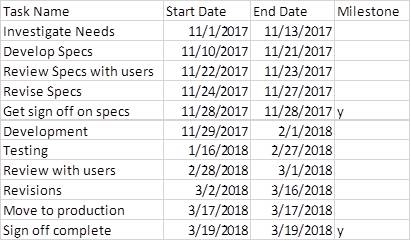 In the Duration column, create a formula that calculates the duration as the End Date-Start Date+1 if the task is not designated as a milestone. The formula for the first row of the table is “=IF(D4<>"y",C4-B4+1,NA())”. The one day must be added to the difference between the start and end dates to account for both dates being part of the task. The NA() formula enters the #N/A value in this column for milestone tasks. 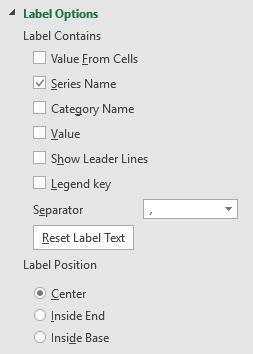 This allows the milestone tasks to be a separate data series with its own formatting. 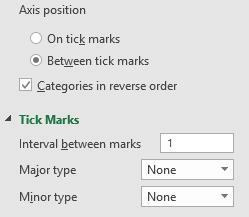 The column for milestone tasks has a series name as a lower case u. This will allow us to show a diamond character for the milestones in the graph (a diamond is the standard in project management for milestone tasks). 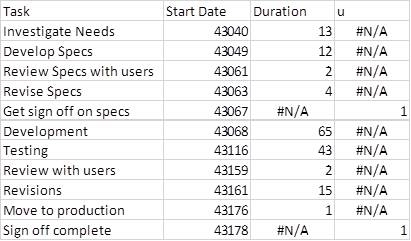 The formula in this column puts a 1 in the cell if the task is a milestone and the #N/A value if the task is not a milestone. In project management standards, a milestone has no duration, but we need a one day space for the diamond shape in the graph. The formula for the first row of the table is “=IF(D4="y",1,NA())”.